Openhand is the name we give to a higher dimensional presence, an integrated energy of Enlightened Masters through the ages, which can empower you in your journey of spiritual evolution. 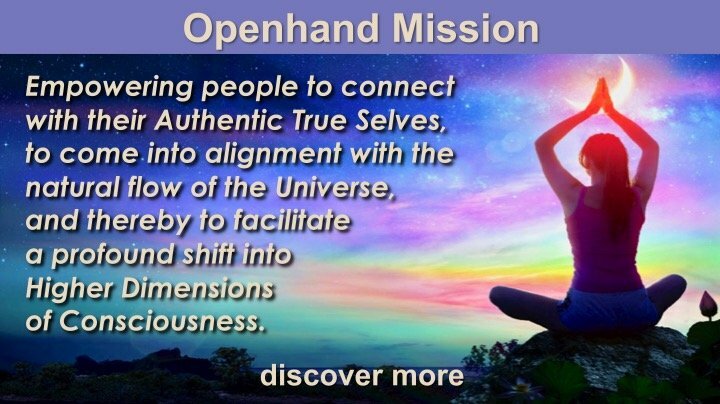 Working with Openhand helps you unveil your authentic True Self, to come into alignment with the natural flow of the Universe, and safely unfold you into higher dimensions. Openhand acts as a bridge into higher dimensions of consciousness to help you embody your higher self. In this way, Openhand facilitates a blessed and magical life, totally at-one with who you truly are. We're supporting evolving people around the world with a common sense of purpose and destiny - to unfold into a New "5D" Paradigm of existence. The Spiritual Courses we offer are geared purposefully in a sequential way. They take place around the world throughout the year. Usually level 1's take place from September to December, level 2's from February to May, and the level 3 once a year in June. There are usually two facilitator gatherings a year. Check our events section for listings.